Good morning. Its a new week starting off nice and bright. The snow has melted away and the earth looks washed clean. I decided its time for me to clean my slate clean and start afresh too. I have made my most needed 'to do' list to get through this day. Cleaned my house where the laundry was looking like it will walk up to me. There is something about pattern and discipline I love, maybe its the fact that its so hard to get. But today is different I am loving it. Laundry is in the washer and carpets are cleaned soft and plumped. I feel like I am walking on air. With a song on my lips and happy flutter in my heart I am feeling generous. Here is a easy peezy recipe to get you into the zing of things. The following recipe is an easy to make banana bread. There is no heavy beating once you have creamed your butter and sugar. Easy to do and gobbled down as easily. Its quite tasty. I have no flowery words to describe its taste. However, the matter of fact recipe is easy and if you have banana thats gone too dark that it will jump into the trash can on its own accord, salvage it. Peel off the black spotted banana peel and mash it up to whip up a quick bread. Now, you can use fresh bananas too it will work just fine. What I am trying to tell you is any reason is good engouh to bake this bread. Dig in it won't disappoint. With wishes that you have a great day as I am having, I am signing off. Looks so yummy. Wonder is one stick of butter = 250g? hey..same pinch..i had prepared a similar one, not bread though..will post it few days !! this looks great !! hi wat a wonderful fotos.. da first eye catcher of this post is definitely the fotos.. congrats. Looks mouthwatering and nice pics. Banana bread looks delicious and pics are really eyecatching.Looks like I am becoming a regular in your blog I love your recipies and pics. beautiful pics..Did u miss the flour among the ingredients ?? Its hasnt stopped snowing here in this part of the world though:) I really liked the way you described "you feeling generous and happy"
I love banana bread..Whenevr I go to Bob Evans restaurant I always eat this!! I will try this at home too once.. I love banana bread, your loaf looks wonderful. I have a large bunch of bananas that we harvested off our tree that is ripe right now. It won't be long before I need to make all sorts of banana bread and other things. wow! the banana bread looks so soft and spongy and I love anything with banana. Your banana bread looks quite fabulous & ooh so tasty! Nice click!!! I so love this bread...your bread has come out perfect. I love banana bread and your recipe is so easy that I'll do it tomorrow! 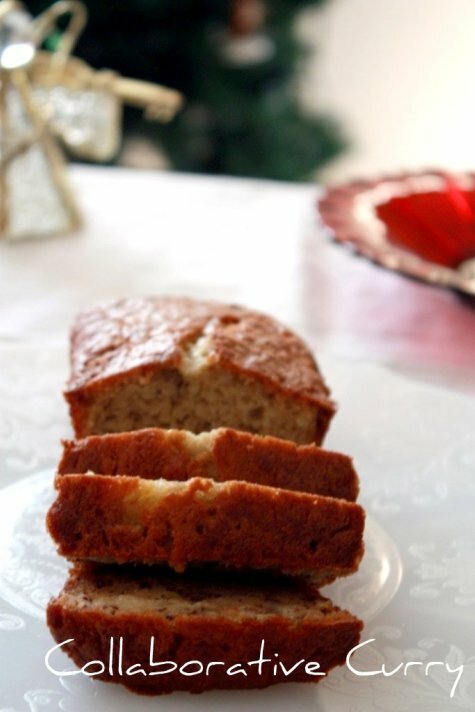 I adore the banana bread....this looks so heavenly delicious. Gorgeous click and beauitful banana bread...looks prefect! u r walking away merrily, while am sulking in the couch cos of the rains..but that dosnt stop me from admiring ur banana bread. can smell bananas here. They look delicious, picture perfect. Mmmmm, scrumptious! This looks fantastic! Looks so tempting . Lovely pics. hey nice clicks..(as always ;))..love this bread...too good. Perfect and easy bread! Beautiful picture. "With a song on my lips and happy flutter in my heart I am feeling generous"
will def try this one out..the picture have me drooling.. I am gonna try out this one soon as the pic too looks very tempting!!! Lovely banana bread, will try this easy simple one. I love this for my breakfast..looks yummy that loaf.. I love banana cake, simply delicious !! this is so perfectly baked bread..yummy and soft, dear! banana bread looks perfect and nice!! after reading your I feel like I am walking on air. With a song on my lips and happy flutter in my heart I am feeling generous. , I think I'm kinda motivated to go around with my duster and vaccum cleaner too, instead of blogging the whole morning , hihihhihiih let me see if I feel like a feather !!! have a nice day!! I am so picky about my bananas...I like them when they are just barely ripe and as soon as they get a brown spot, I set them aside for banana bread. Thanks for sharing this recipe - I'm always looking to try new ones! 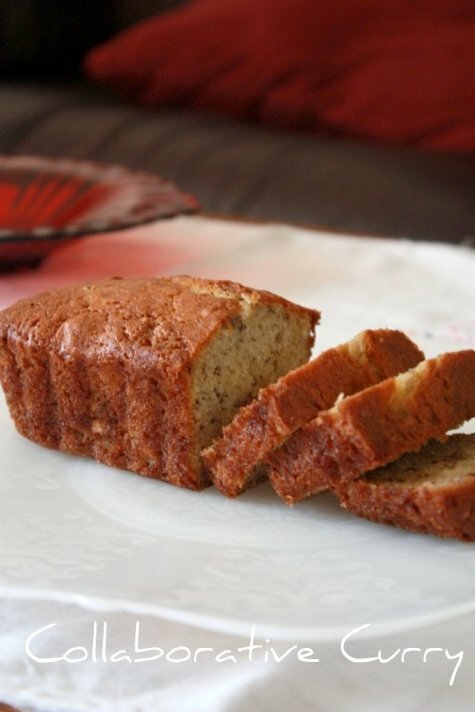 This is a wonderful easy peasy banana bread recipe. It looks great!